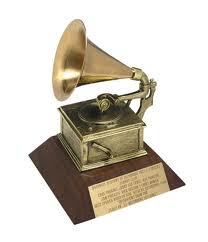 Reprise Records congratulates Green Day and Billie Joe Armstrong for winning a 2011 Grammy Award for “Best Musical Show Album” for American Idiot: The Original Broadway Cast Recording. Released in April, the official album features the 24-member cast of the smash-hit musical accompanied by Green Day, marking another incredible collaboration between the band and the musical. 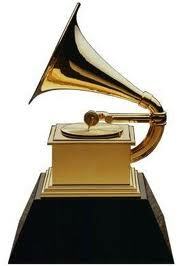 This is the fifth Grammy win for Green Day. The band has previously won twice in the “Best Rock Album” category for their platinum sellilng album 21 Century Breakdown, as well as for their blockbuster 2004 album American Idiot. They have also won in the “Record of the Year” category for the single “Boulevard of Broken Dreams,” and in the “Best Alternative Music Performance” category for their Diamond-certified 1993 album Dookie. American Idiot tells the story of three lifelong friends, forced to choose between their dreams and the safety of suburbia. Their quest for true meaning in a post 9/11 world leads them on an exhilarating journey. The result, according to the Toronto Star, is“The first great musical of the 21st century!” Based on Green Day’s groundbreaking rock opera American Idiot, Armstrong and the band collaborated with one of the theatre’s most acclaimed creative teams, led by the Tony Award-winning director Michael Mayer, Pulitzer Prize and two-time Tony Award-winning composer and orchestrator Tom Kitt, and Olivier Award-winning choreographer Steven Hoggett, to bring this explosive, iconic album to the stage. Billie Joe Armstrong is currently playing the role of “St. Jimmy” in American Idiot, through February 27, 2011, at the St. James Theatre, 246 West 44 Street. 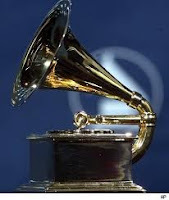 Here are the winners the 2011 Grammy Awards, which took place Sunday night at the Staples Center in Los Angeles. Pop Collaboration With Vocals: “Imagine,” Herbie Hancock, Pink, India.Arie, Seal, Konono No 1, Jeff Beck & Oumou Sangare, The Imagine Project? Best Traditional R&B Vocal Performance: John Legend & The Roots, “Hang On In There,” Wake Up! Best R&B Song: John Legend & The Roots, “Shine,” Wake Up! 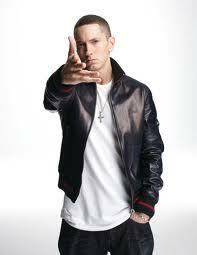 The evening was supposed to be a coronation for Eminem, who was up for a leading 10 awards. But on Sunday night (February 13) at the 53rd annual Grammy Awards, Slim Shady ended up with only two rap honors as his smash comeback Recovery took a backseat to country trio Lady Antebellum, who shocked the world with a slew of high-profile wins and a night’s-best haul with five Golden Gramophones. But that wasn’t the only banner headline of the night. 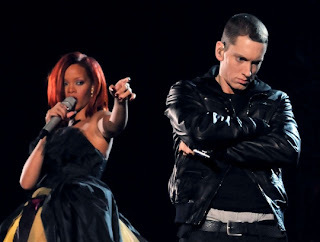 No, the Album of the Year category served up one of the all-time jaw-droppers in Grammy history, as Eminem was denied that honor for a third time. Many considered that one a lock for the superstar Detroit rapper, whose fight back from addiction to mega-platinum success was the kind of redemption story the Grammys simply can’t resist. Lady Gaga just keeps topping herself, doesn’t she now? The eccentric singer is up for six awards arrived on the red carpet in a giant translicent egg carried by attendants dressed in gold costumes. Who Will Be Taking Home The Grammys This Sunday? 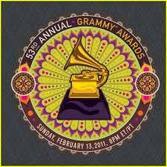 This Sunday, the titans of the music industry will convene on the Staples Center in Los Angeles for the 53rd annual Grammy Awards, the annual celebration of back-slapping, glad-handling and, of course, melisma. And while most of you are probably just tuning in for Recording Academy President Neil Portnow’s annual keynote address, I’ll be watching this year’s Grammys largely for the same reason I’ve watched them every year: to see if my predictions come true. See, for just about as long as I’ve had this column, I’ve been makingGrammy picks. It’s an annual tradition, mostly because I love the Grammys — just about as much as I love gambling. Lady Gaga has confirmed she will perform at the Grammy awards. The singer tweeted this afternoon to confirm she will perform at the awards on February 13 – where she is expected to debut her new single ‘Born This Way’. 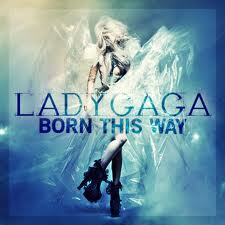 When asked whether it was true she will appear by fans, Gaga responded simply by tweeting “yes”. Gaga opened the Grammy awards last year, giving a show stopping performance which saw her and Elton John duet together. Meanwhile Britney Spears – who premiered her new single ‘Hold It Against Me’ this week – is also expected to perform at the event, held at Los Angeles’ Staples Center, though a source has said her team are “keeping the plans under wraps” so she surprises her fans at the event.